Late this morning, many of the residents along Sherman Ave. just off of Santa Cruz Ave. were putting the finishing touches on the over-the-top Halloween decorations the west Menlo street has become known for over the past decade or so. In many respects, ground zero is the home of Arthur and Susan Chait. When the Menlo team walked by, Arthur was working with neighbor Mitchell (in Giants jersey) on the many flying ghosts that adorn the front yard – a good mixture of friendly and frightening. “Sherman has always been a good Halloween street,” said Arthur, “but about 15 years ago I started adding gadgets to our front yard display. It’s grown from there. 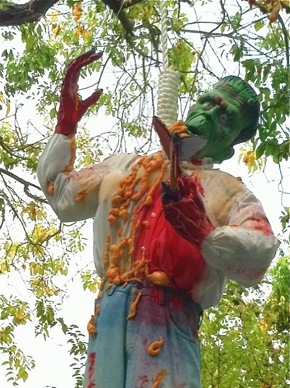 Hint: if you’re walking along Sherman either today or tonight, don’t forget to look up – there’s a plethora of ghouls, goblins and scary monsters hanging from the trees. We’ve heard reports that the streets around Allied Arts Guild are also popular trick or treat destinations. Two other perennial favorites: the Stahlers’ home on Valparaiso and Willie Mays’ home in Atherton, where real baseball treats have been known to be dispensed from. We think the greatest Giant – and we think the greatest baseball player ever – may be preoccupied this year with his team in the World Series; game time in 5:20 pm. Other Halloween festivities today in Menlo include parades and parties in the University Park and Lorelie neighborhoods.